3.14.2014. My dollmaking has been about exploring where my hands will lead me. I like the term BRICOLAGE, French for "tinkering," referring to the art of making stuff from what happens to be lying around. What I have lying around is an accumulation of flowery cottons I keep picking up at the used craft supply store. I'm just reaching the level of confidence where I might be able to give some of my creations away. 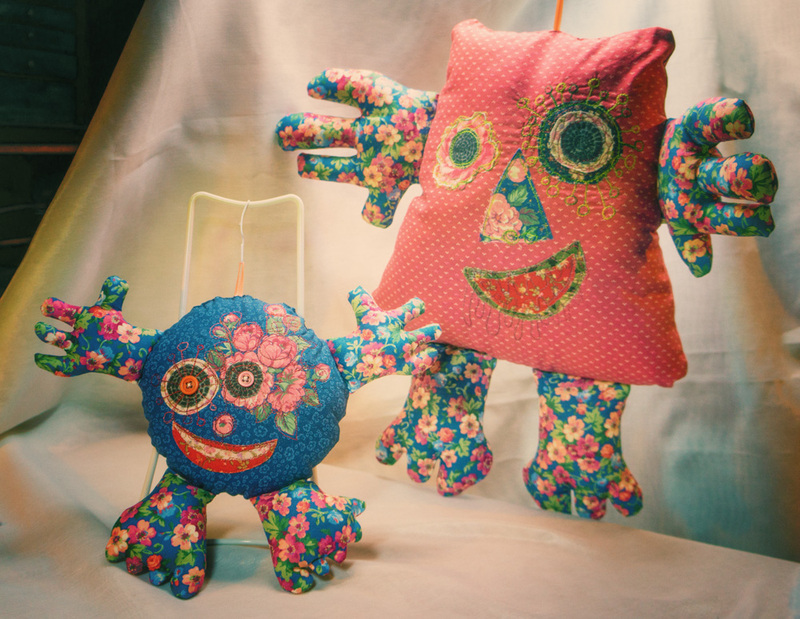 When I bought a magazine called Stuffed: The Crafting of Softies, I figured now was the time to make a gift for the youngest member of our family, the toddler Maya. I wound up with two dolls because (consequence of winging it) the first set of limbs were too small. Rather than throw them away, I made a second, smaller version for the second youngest family member, 8-yo Gabrielle. 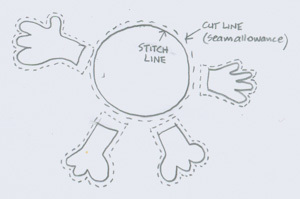 :: Make paper patterns as desired to keep hands/feet consistent, left and right. 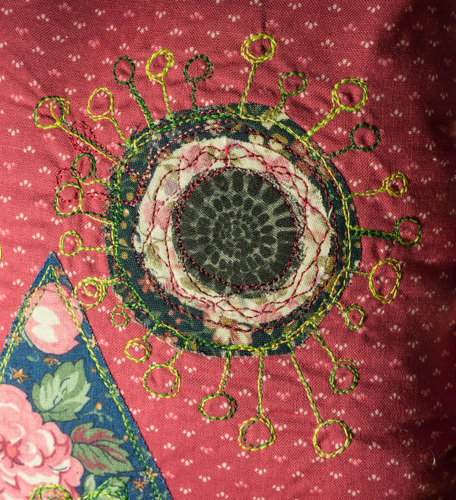 :: Decide on appliqués -- shapes cut randomly from fabric or "fussy cut" specific prints (like a rose or circle design -- see rose below). :: Bond the target appliqué fabric to Heat 'n Bond Lite (a paper-backed iron-on adhesive, suitable for sewing through) with a medium-hot dry iron for 2 seconds. A teflon press cloth comes in handy to protect your iron from errant glue. I learned the hard way to cut the adhesive smaller than the cloth for this first pass. :: Trim your appliqués to their final shape with a small scissors. Peal off the paper backing. Position them and press them again for 6 seconds to melt the glue and make a permanent bond. :: I glue-basted some Pellon interfacing to the backs of the bodies to stabilize the light material for machine embroidery (505 spray on one, Elmer's school glue [ironed to set] on the other). Any stabilizer will do -- even paper, which can then be torn away. 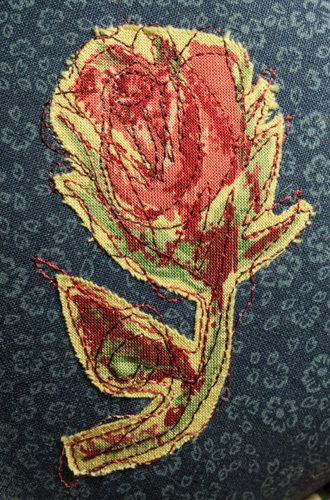 :: Embroidery: I used the darning foot and set the stitch length to 0 to allow free-motion doodling with thread. Once you get the hang of it, it's the most fun part. I didn't worry about covering each edge, which will allow for a nice fuzziness as the dolls age. 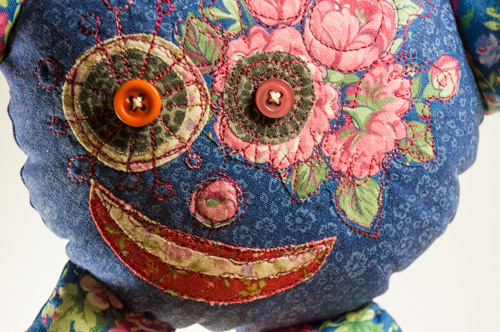 I added button eyes to the second softie, since it will be going to an older child. On the back, trim away any excess interfacing. 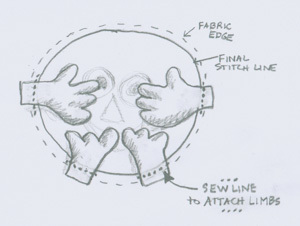 :: Appendages: With right sides together, sew the appendages along the stitch line, leaving the ends open. Trim seam allowances to 1/8" and clip curves. Leave an inch of fabric at the open end. Turn inside out and press with a little spray starch. Stuff with Poly-fil, leaving that bottom inch empty. 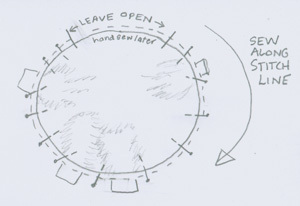 :: Turn inside out through the opening. Pop! The doll gives birth to itself through its head! Make sure it's all turned, running a chopstick around the inside seams. Give it a little steam press to make the edges smooth as possible. 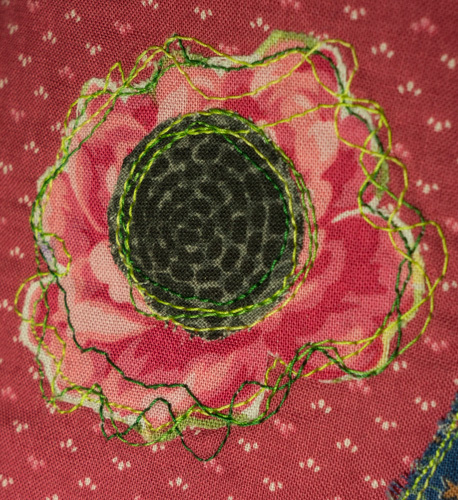 Press the edges of the opening in, on the stitching line to help you hand-stitch later on. :: Stuff the body with lots of Poly-fil. Hand-sew the top closed. I included a little ribbon in the top seam, so the dolls can be hung up. These aren't really hard. You just need to be patient and have fun.